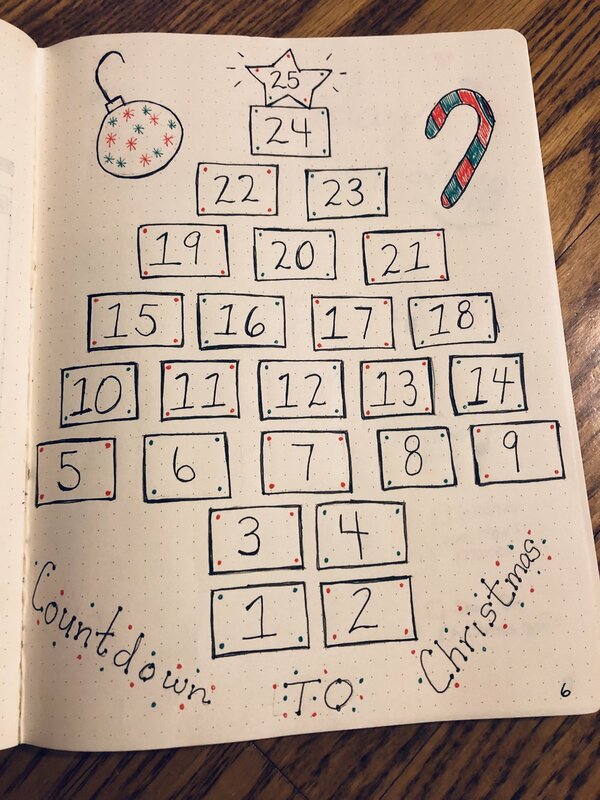 Christmas Bullet Journal Ideas That You Don't Want to Miss! So, I got back into my bullet journal over the Thanksgiving break and started a few Christmas pages....to say it was therapeutic AND fun is an UNDERSTATEMENT! I love the holidays, and this just got me a little more excited. I think making those pages doesn't take A LOT of my brain power, so it's kind of relaxing...now, I am NO artist, so that's a whole other issue! But, it's just for me (and I'm showing y'all), so what does it matter? Right? Ok, right! Anyway, here is a peek of some of the pages I did (while I probably should have been cleaning my house!). I love this page....why? Well, mostly because it's in the shape of a Christmas tree, and, it is like my own little personal advent calendar. I just thought it was super neat. Ok, this is self-explanatory.....and it's also BLANK!!! Ha! Better get to working on that! I do have some ideas, but most of my family can see this, so I wasn't going to jot them down before I took the pic! That would be TERRIBLE! I probably could have put a budget column AND kept the cost column. I have a tendency to budget a certain amount but ALWAYS spend a completely different amount! Ok, have to remember that for next time. These are little things that I want to make sure I do before the Christmas season is up. I always keep these little things in my mind, but sometimes after Christmas, I am like "Oh, I forgot to do _____"! These are all pretty basic, but you could be more specific. I didn't want to put anything on my list that I KNEW I couldn't get to. And, I have room to add more.....we shall see. I put a pic of my weekly calendar in my last post about starting a bullet journal, and it worked so well, that I have continued it. I like to fill it in and if I don't get done on Monday what I wanted to get done, I just move it to Tuesday...., I haven't filled this in for the week either because I made the weekly calendar, realized I had put the wrong dates that correspond to the days of the week, and had to do it over. (I know I said that this journal is for you to see and not really anyone else, but that would have driven me crazy!). I just fill in what I plan to do and put a little box next to it, and get to work! Why is it so satisfying to fill in that little box when I complete a task? So, these are just a few examples of some holiday bullet journal pages that you can do. There were so many more! I could have done one for a Christmas Card list, but I already have that list in an address book and there are so many names and addresses, that I did not want to re-invent that wheel! I have also seen some for recipes, grocery lists, really anything you can imagine that would be helpful to you! That's the beauty of it, no one's has to be the same, and you can individualize it for YOU! Did any of you start a journal? I'd love to know AND I'd love to see pics!